Kushner Companies' Pitch To Chinese Investors Raises Conflict Of Interest Questions : The Two-Way The sister of President Trump's son-in-law, Jared Kushner, highlighted her powerful brother as she sought financing for the family firm's real estate project in New Jersey to Chinese investors. Chinese staff wait for investors at a reception desk on Sunday in Shanghai, China, during an event promoting investment in a Kushner Companies development. 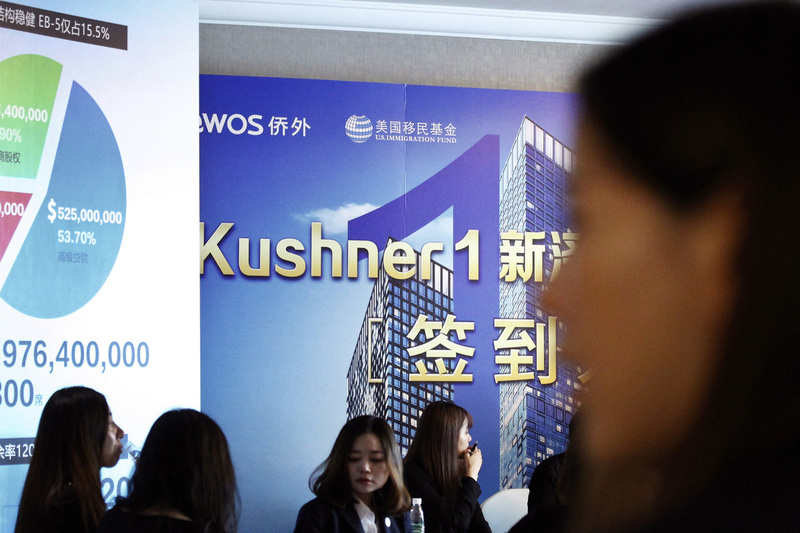 The sister of President Trump's son-in-law, Jared Kushner, highlighted her powerful brother as she pitched financing the family firm's real estate project in New Jersey to Chinese investors. That's according to reporters from The Washington Post and The New York Times, who were attending the publicly advertised event at the Ritz-Carlton Hotel in Beijing on Saturday before press was removed from the room. "Speaking in a ballroom, [Nicole] Meyer said the project 'means a lot to me and my entire family,'" according to the Times. "She mentioned her brother's service as chief executive of Kushner Companies, the family business from which he resigned in January, saying he had left to serve in the Trump administration." This is the latest in a series of conflict-of-interest questions surrounding the vast business interests of top Trump administration officials. "It's highly problematic," Noah Bookbinder, the executive director of Citizens for Responsibility and Ethics in Washington, tells NPR. "It appears that Jared Kushner's family business is using his name and his official position to bring in investment." Kushner Companies "apologizes if that mention of [Meyer's] brother was in any way interpreted as an attempt to lure investors," it said in a statement emailed to NPR, adding that it was not her intention. It said the One Journal Square project would provide millions in tax revenue and bring in thousands of construction jobs to New Jersey. The event was organized by QWOS, a firm that helps Chinese citizens access U.S. green cards through investments. Its advertising highlights the controversial EB-5 visa program, which provides a path to a green card to foreign nationals who invest at least half a million dollars and create 10 full-time jobs. "Invest $500,000 and immigrate to the United States," said one pamphlet for the event to raise money for the project, according to the Post. The program is popular with some commercial real estate developers, who use it to raise funds for their projects, as NPR's Greg Allen has reported. But it has also been linked to fraud schemes and critics are uneasy about the idea of "essentially selling visas to wealthy foreigners with no proven skills, paving the way for money laundering and compromising national security, as Bloomberg reported. Before Kushner joined the Trump administration as a senior adviser, the news agency added, his family firm raised some $50 million through the EB-5 program for a Trump-branded luxury apartment building in New Jersey. Kushner's lawyer, Blake Roberts of WilmerHale law firm, said in an emailed statement that Kushner "will recuse from particular matters concerning the EB-5 visa program." Bookbinder, from the watchdog group CREW, says that "at this point, it might make sense for him to consider broader-based recusals on China issues as well, as more and more business ties keep on coming up." "Mr. Kushner has no involvement in the operation of Kushner Companies and divested his interests in the One Journal Square project by selling them to a family trust that he, his wife, and his children are not beneficiaries of, a mechanism suggested by the Office of Government Ethics." Kushner's mother and siblings are beneficiaries of that family trust, a White House official confirmed. Ethics watchdogs had wanted to see Kushner's assets sold to independent third parties, rather than to a family trust.